Container gardening reflects each gardener’s personal style, so you’ll see a wide array of designs—one size definitely does not fit all containers! Even so, you’ll want to keep in mind two strategies to guide your composition—selecting equal parts foliage and flowers and categorizing your selections into “spillers,” “fillers,” and “thrillers”—terminology coined by the late Kathy Pufahl, founder of Beds and Borders, Inc. Flowers are natural attention-grabbers—it’s literally the role they were born to play to attract pollinators, so it’s not surprising gardeners use flowering plants for an instant wow-factor. Yet, as charming as they are, flowers are also fleeting and if the weight of your design relies heavily on these transitory blooms, you’ll be left with a lackluster show once they’re spent. 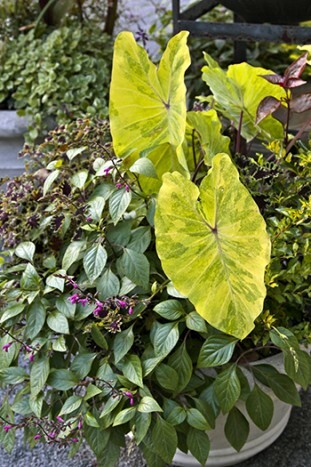 To bolster the longevity and interest of your design, choose half your plants for either exciting foliage—think bromeliads or elephant ears (Colocasia sp.) —or quirky forms—like corkscrew rush (Juncus effusus ‘Spiralis’). That way flowering plants can run the other half of the show. As you select your plants, visualize their roles as potential spillers, fillers, or thrillers. 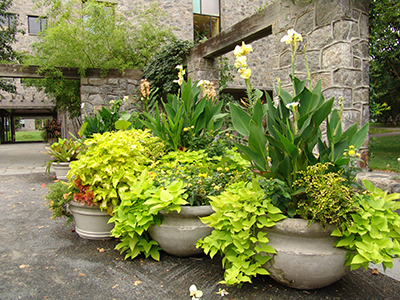 Spillers provide a base that gracefully cascades from the container, giving the composition a more vertical form. Sweet potato vine’s (Ipomoea batatas) vigorous growth and intense color make it a favorite among spillers. Fillers weave throughout, for a happy medium that unifies the composition. Coleus, Swedish ivy, (Plectranthus sp.) and begonias are excellent fillers with varieties of color and texture. Thrillers, of course, are the stars of the show. 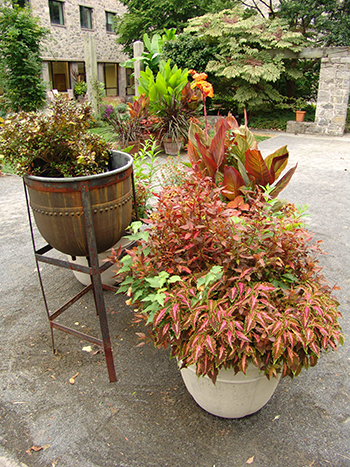 Often dominating containers with intense form, color or size, thrillers demand attention and are typically the crown jewel of an eye-catching display. 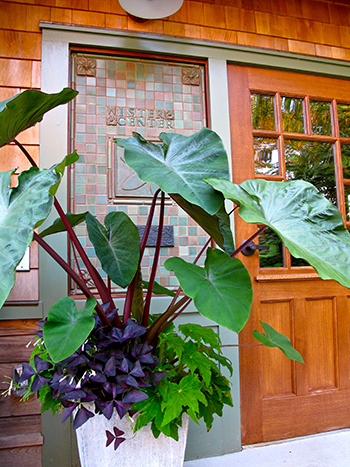 Cannas are often used as thrillers for their dramatic vertical form, saturated blooms and bold foliage. Bananas (Musa sp. and Ensete sp.) 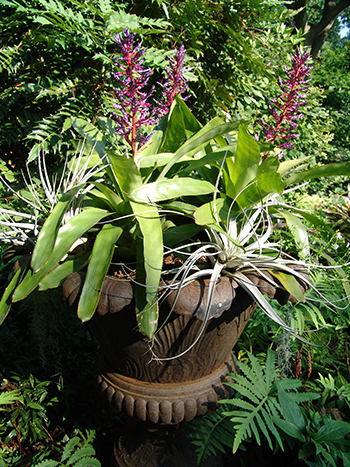 instantly add an exotic twist, and ornamental flax (Phormium sp.) offers a kaleidoscope of colored stripes to suit nearly any container design. 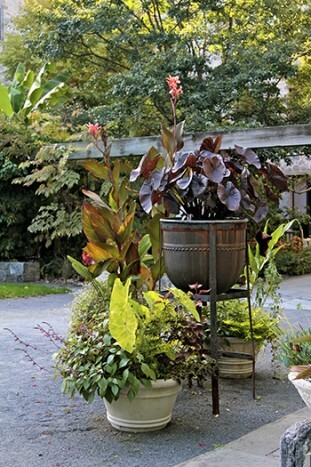 When it comes to container gardening with tropicals and annuals, don’t be afraid to experiment with a variety of plant combinations and design strategies. Like any art form, design guidelines can be tweaked, stretched or abandoned altogether to make way for something completely new and completely you! Your imagination is the only limit! 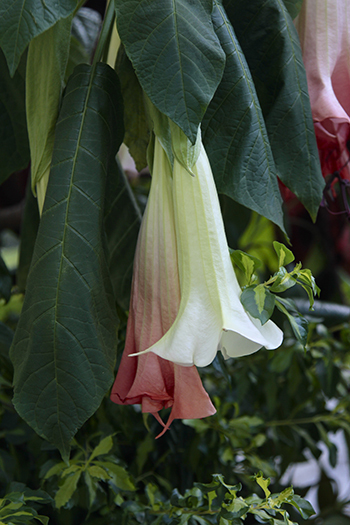 Find great plants to experiment with at the Unusual Tropicals and Annual Sale on May 16. This complete article originally appeared in County Lines April 2015 issue.